Members of the Caithness Countryside Volunteers turned out in force on Sunday (30 October 2016) to assist with a habitat enhancement project for a rare butterfly species in the Dunnet Bay area. Dunnet Bay is home to the most northerly colony of the Small Blue Butterfly whose caterpillars depend solely on kidney vetch as a food source. The volunteers concentrated on planting out kidney vetch in the dunes and Castlehill area where there are existing colonies. The volunteers also scraped back vegetation to open up areas of bare ground to encourage the natural colonisation of the kidney vetch plant. This event is part of a large project lead by the Caithness Biodiversity Group called "Small is Bluetiful". Highland Council Ranger Marina Swanson said: "We got a fantastic turn out for our event on Sunday and due to the hard work of our volunteers, we planted out plenty kidney vetch and opened up suitable new areas for colonisation. 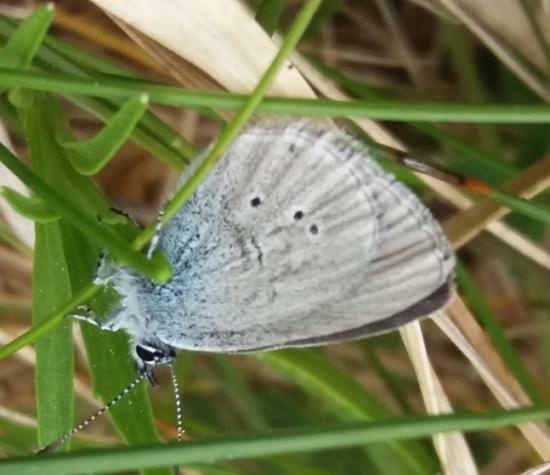 We are very grateful to our volunteers for all their efforts and are confident the enhanced habitat will make a real difference to the existing colonies of Small Blue Butterflies." The Caithness Biodiversity Group wishes to thank the Landfill Communities Fund, Highland Council and Dunnet Bay Distillers Ltd for their financial support, also Butterfly Conservation Trust, Scotland and Scrabster Harbour Trust for their help and advice.